About the Woad. I haven’t written much about Woad since there hasn’t been any for awhile. 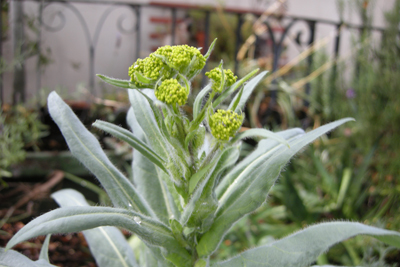 Woad is not a desert plant. (Pause for a moment of duh.) My area of southern California is what some may call “reclaimed desert”. Something you can forget until the car breaks down in the San Fernando Valley in July and there is your reminder. 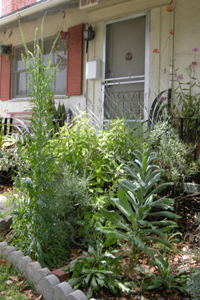 Two years of drought wiped out whatever Woad I still had growing. 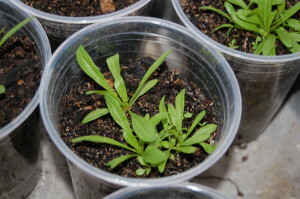 But, I still have seeds from the last plant so I’m going to try again this year. 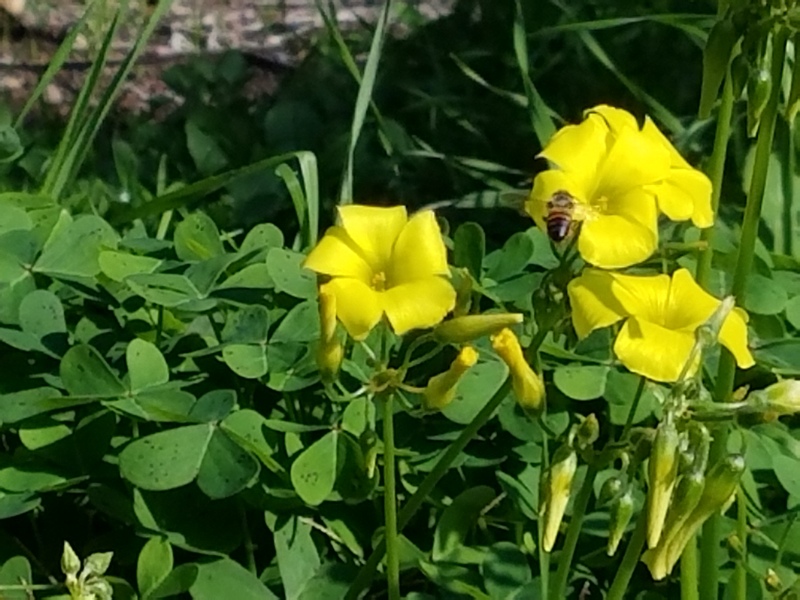 Nothing of course can wipe out Oxalis. 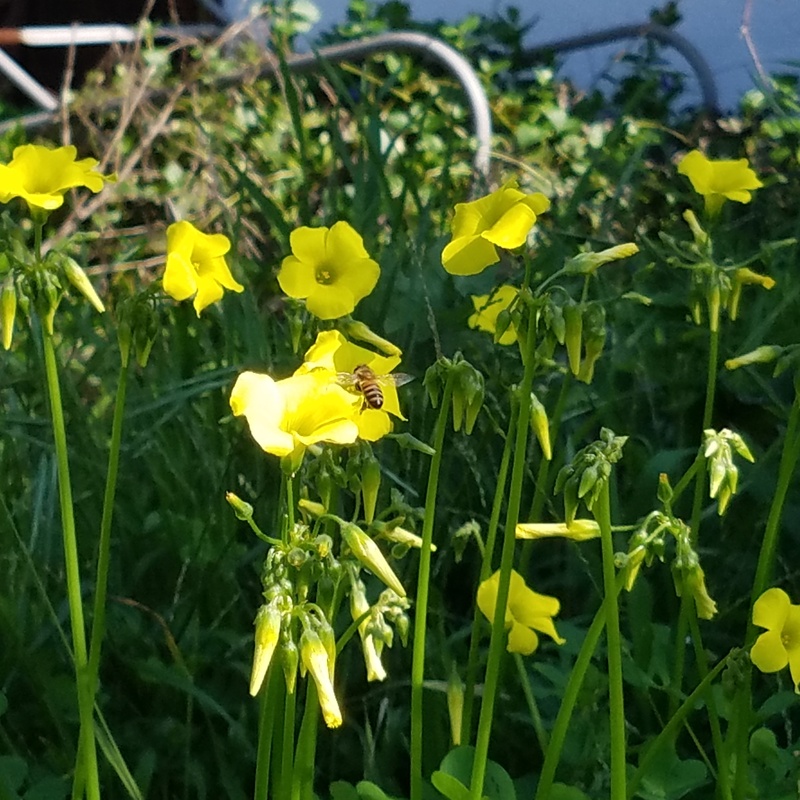 And the bees like it. My other on-going project will be mordanting cotton following the method described in John Liles ‘Art and craft of natural dyeing”. Lots of scouring, soaking and then mordanting, more steeping, more soaking and then you get to the actual dying. That time of the year again. 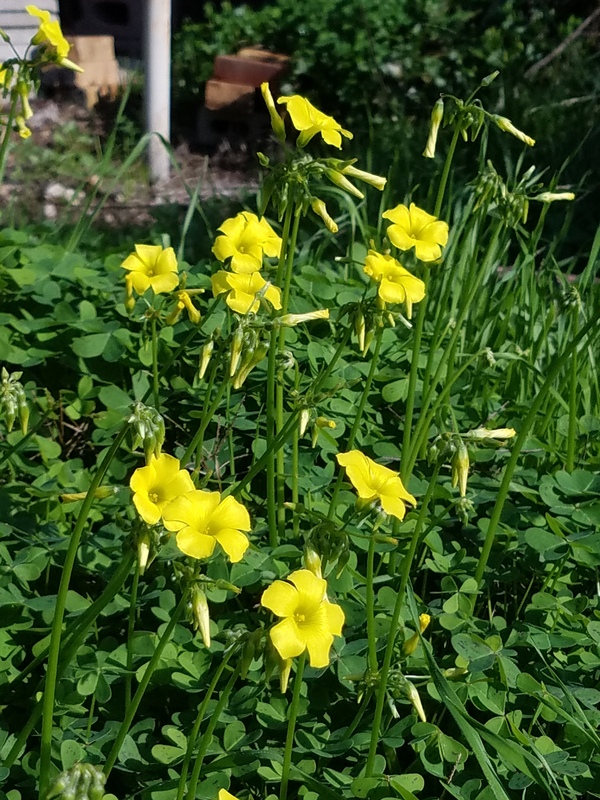 When the Oxalis makes another pass at taking over the yard. 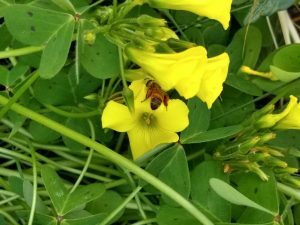 Fortunately the bees really like it and it makes a good dye for cotton and wool. I have lots of Rosemary. Even sharing it, making incense and medicinals there’s lots left over. At some point it does have to be trimmed back so I tried it out as a dye plant. 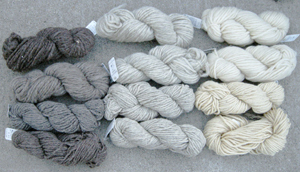 The bottom row is what I started out with, my standard Bartlett yarn ‘natural white’, light gray, medium and dark gray. Cotton was unsuccessful. For the dye stuff, starting with Ida Grae’s suggestions* I used fresh Rosemary 1×1 and 3×1. Simmered the Rosemary for an hour and let it cool over night. 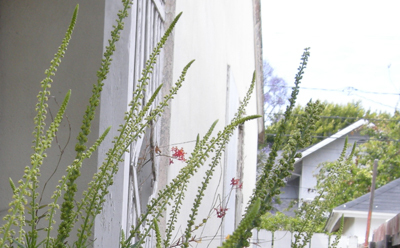 Here are a couple of sites that describe Rosemary as a dye. Ida Grae points out that most cooking herbs will produce yellows. If I can eat or use something as a medicinal I tend not to dye with it but the Rosemary here is so plentiful it’s worth trying. Same probably goes for Lavender but I haven’t tried that yet. *Ida Grae / Nature’s Colors: Dyes from Plants, 1979. This was back in April the Weld started shooting up. 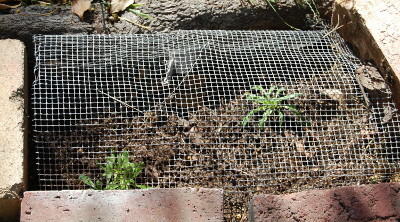 The tomato cage might give an indication of the height of the plant. I’ve seen them grow much taller. This one however is flowering so it’s unlikely to see more growth. Almost ready for seed saving. 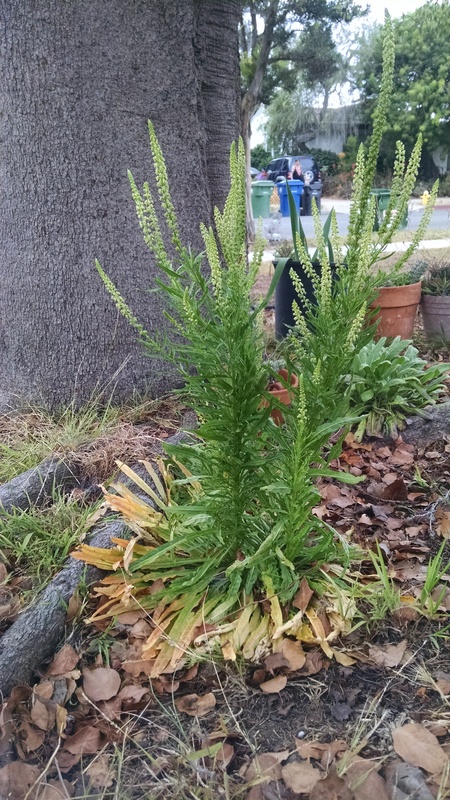 Weld plants from June to July. Some Woad in the background. These seem to be surviving the drought weather under tree shade. 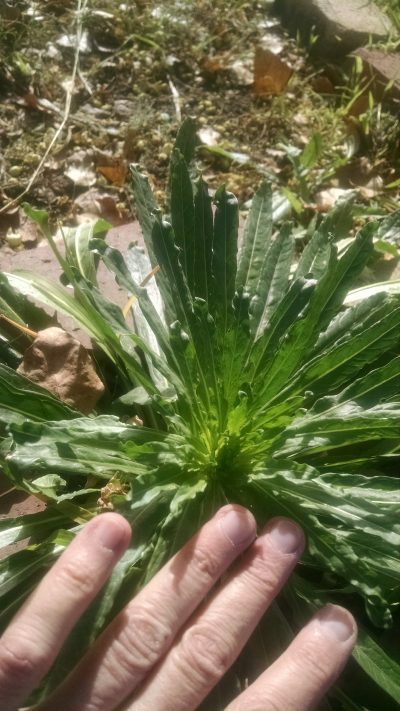 Last year’s Weld and Woad and actually most of my herb garden didn’t survive the heat wave so this year I’m more focused and picking areas of the yard where they might survive. 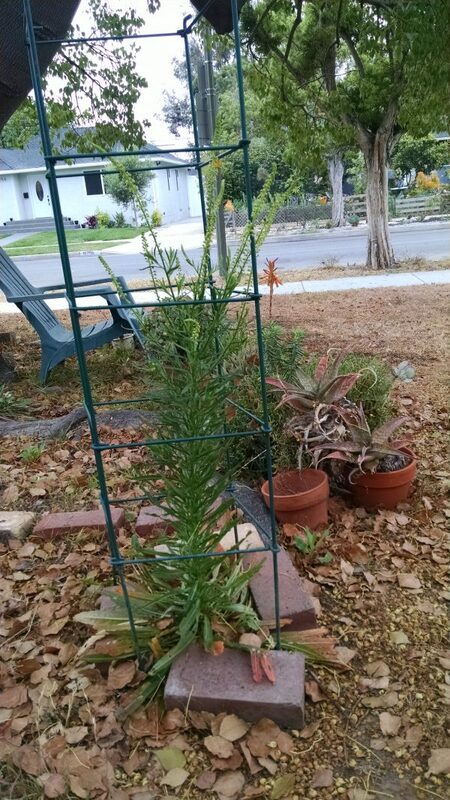 For the record, mine are growing these in southern California, USA. Definitely not native to the area. The two pictured have started blooming and not (not in the picture) haven’t taken off yet. 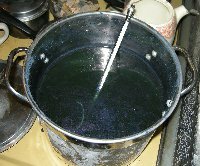 But even two plants can be good for dyeing since Weld is one of those wonderful plants where everything from areal parts – from the ground up is used. More about Weld: <http://www.wildcolours.co.uk/html/weld.html> from Wild Colors in the UK. 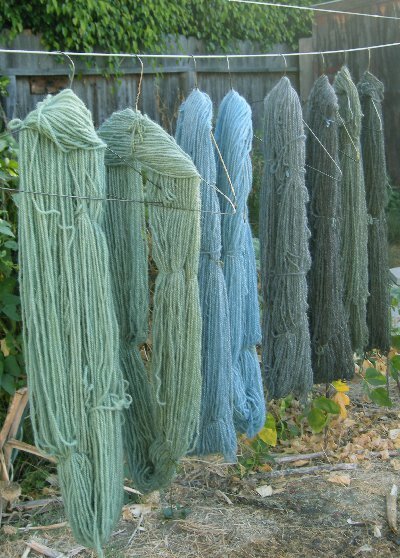 Good pictures and info about growing, harvesting and dyeing. “Natural” and the definitions of that word have been on my mind lately. I’m taking my first, bumbling steps at teaching a dye plant workshop and while my description would be “vegetable dyes” everyone seems to be calling it “natural dyes”. And yes, this does involve working with plant based dye materials that occur in nature, I find the term “natural” kind of misleading or at least confusing. 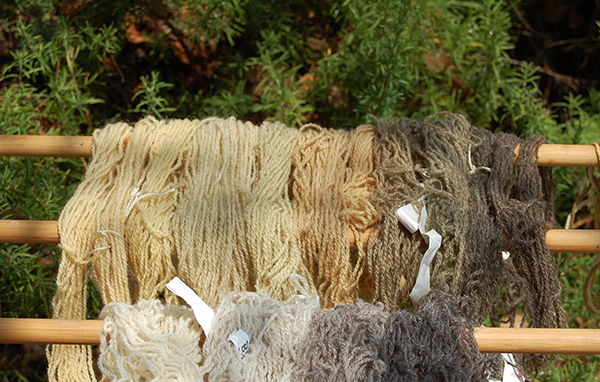 “Natural dyes” seems to imply methods that are safer, non-polluting, better for the environment, etc. As the kids say, Not. Or at least not necessarily. From what I’ve read on the subject it appears that dye work was often a pretty nasty, polluting industry. Supposedly in time of Elizabeth I (England) the dyers had to work some specified distance from town because of the stench. Remember the stale urine for indigo? Chemical additives – mordants, however “natural” in origin were often poisonous for the dyers and polluted water sources that material was dumped into. Which is not to say one can’t use mordants safely but with the same safety practices and precautions one would use with synthetic dyes. 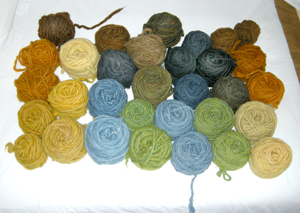 Aren’t natural dyes safer than synthetic dyes? : Paula E. Burch, Ph.D. ( Her All About Hand Dyeing is an excellent dye resource.) 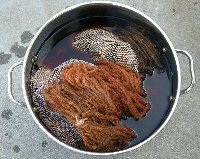 In this (web) article Burch points out that “..Some natural dyes are almost perfectly safe; others are quite toxic. Some synthetic dyes are safe even to eat; others are too toxic to bring into your home. ” Know what you are using and how to use it safely. Respect your materials. Also see: Natural vs synthetic: from Dharma Trading Co.
With wool I manage color range by using white, lite, medium and dark sheep gray from Bartlett Yarns. The only other fiber I work with is cotton and I’m trying out using white, brown and green cotton for the range but that is still in the we’ll-see phase. I haven’t posted in a while. Starting new plants and trying to regrow what I lost in the last heat wave. 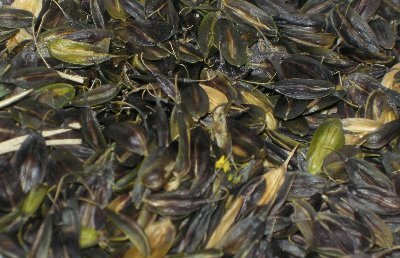 Even though my Woad plants curled up and died there were seeds from that last batch. I’ve been moving them a few at a time into the yard. 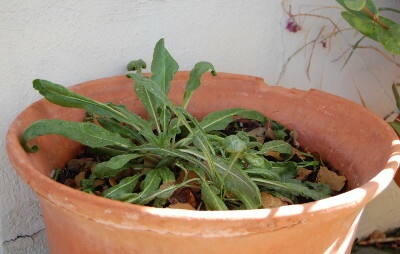 This one (above) is the growing-Woad-in-a-planter experiment. 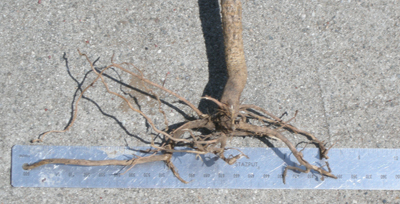 Since the roots seemed so shallow it seemed possible that it might thrive in planter. 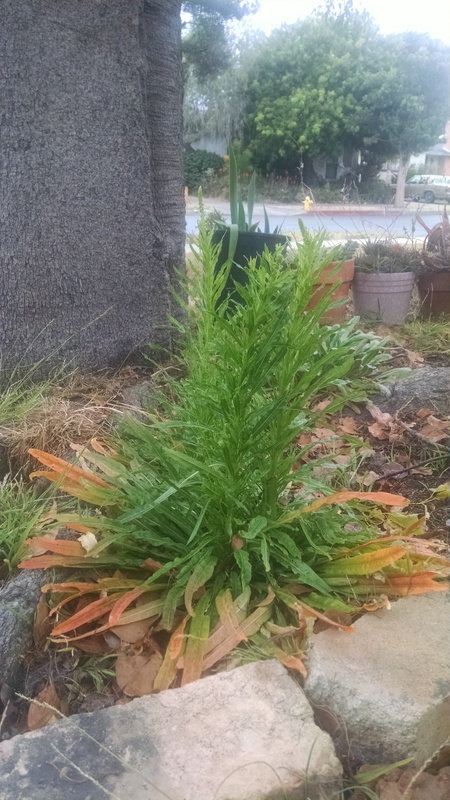 This is the root from a Woad plant that went to seed last fall. Looks like it could be small enough to survive in a planter. I’m still collecting Woad seeds. 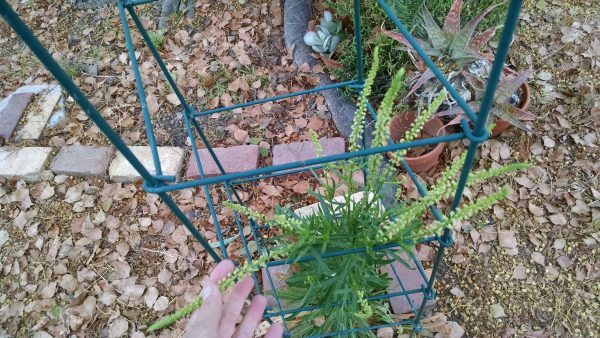 When the one plant that had started going to seed took off I wrapped it in a tomato cage and will continue collecting seeds as long as they appear. Also on the to-do list is to start sending out seed packets to various fellow-dyers. 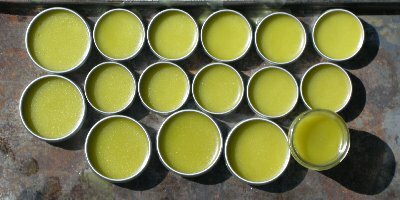 My idea of an enjoyable weekend: dyed more yarn, Woad and Onion peel pots and made a batch of Plantine and Lavender salve. Most of the time my Woad plants have looked rather cabbage-like. Now that one of them has switched into seed producing mode it is shooting up like a mutant broccoli. For the Weld, I’m going to dry most of the plants and let a bit go for seeds.